The Couture Butterfly: Birthday Wishlist! Someone I know very well has a birthday coming up! It's me! So it's my favorite time of year and the best part about my birthday is the multitude of inspiring pieces for the new fall season. I enjoyed making this collage using PicMonkey. I didn't even have to create an account to use it! This is such an easy site to use and create using collages. I admit PicMonkey was more efficient than using Photoshop. As much as I have used Adobe, there was too much fuss trying organize photos and rearrange items to fit how I wanted them too. There are so many different choices to give your collage a personalized feel including inserting your own creations. I am using PicMonkey from now on for all my collage needs. even if you are doing an inspiration board it is perfect and so simple to use! 1. Sweater || H&M || - I love this sweater! The diamond print on it, although large, it doesn't take away from the casual chic. 2. Serinna Boots || Aldo || - I have been stalking these boots since I saw them in a fashion magazine. Aldo makes really stylish, yet comfortable boots and I am eager to get these on my feet. 3. Purple Velvet Skirt || Sewing Project! || - Velvet fabric has been haunting my existence since the past season. I made a pair of leggings using crushed velvet but I've been wanting to create a skater skirt using regular stretch velvet. I can't wait to get the fabric. 4. Slow Cooker || Bella || - I was in Walmart a few days ago and stopped dead in my tracks when I saw this cooker. Not only is it the best color in the world (and my favorite) but it has received great reviews and is under $40! 5. LIGHTS Little Machines (F) | Clean Bandit New Eyes (R) || Vinyl Records || - There is no greater way than to get the party started than with an upbeat record. I am a fan of LIGHTS and have recently become addicted to "Rather Be" by Clean Bandit. Both would be guaranteed to stay on my record player for the long hall. 6. Gummy Bear Studs || Vinca USA (Nylon) || - When I saw these I could not resist adding these to the list. They are a combination of two things I love teal and gummy bears! So adorable! 7. OtterBox Case for iPhone 5 || OtterBox || - I figured I'd eventually buy one of these since they protect your phone from literally everything, not to mention it would be hard to loose your phone with a case as bright as that! 8. "Cosby Sweater" || EBay || The one thing I look forward to when it gets cold is the ability to wear sweaters. I love all kinds of sweater, but I especially love bright sweaters that resemble ones that Bill Cosby used to wear on TV. The downside is they are usually men's sweaters and have to be tailored to fit, but I don't mind because the colors are undeniably fierce! 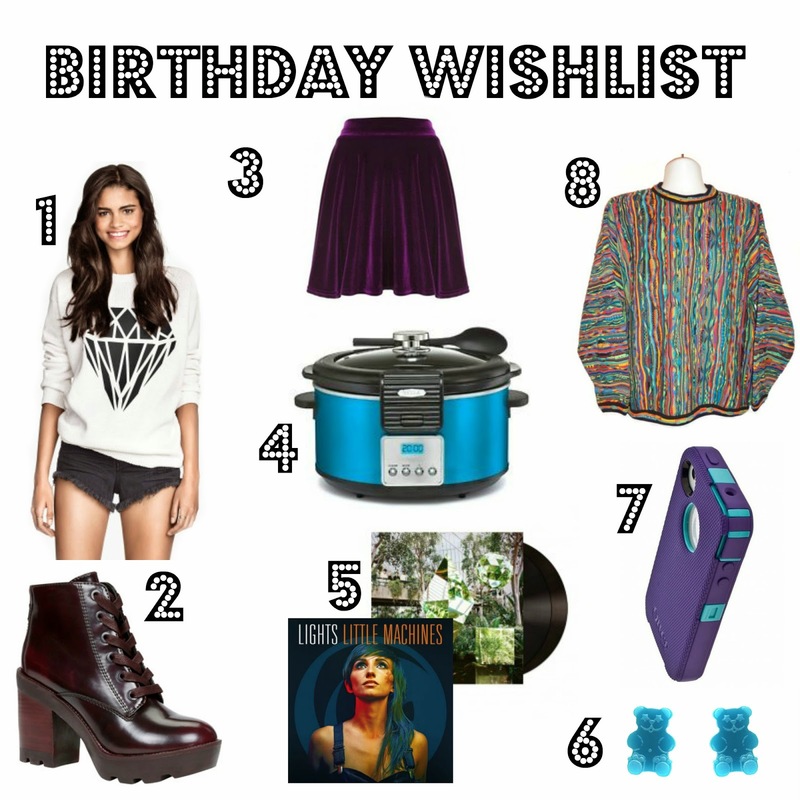 Do you have a wishlist? This is mine!